Two weeks ago I went to a bridal expo in Sacramento with my mom, sister Dani, and future sister-in-law, Amber. It was an okay experience for us, although we weren’t as into it as some of the other brides were. We were there more to get ideas whereas a lot of women were doing some serious vendor hunting. The majority of the vendor booths had raffles going on so we signed up for quite a bit of them hoping we’d win something. If it’s one thing I learned it’s don’t give out your phone numbers unless you want to be bothered to death by vendors. They’ve been bugging me all week! One of the raffles we signed up for was to win a Mary Kay bridal package. From what I understood it entitled me to a bunch of “free goodies” (apparently $500 worth to be exact) and something about make-up for my wedding day and a facial. Somehow Amber and I got talked into doing a pampering session to try stuff out. We figured why not, it’s free, and we can invite our bridesmaids over for a little get-together. So that’s what we did. I got a call from my MK rep a couple days before the scheduled get-together telling me I had won the bridal raffle. She kept emphasizing the “free goodies” I would be getting and that she would explain everything at our scheduled party. I was excited about it, but I was warned by a friend who was a former MK sales rep.
One of the first things I learned in training was that EVERYBODY WINS. A strategy of MK is to place out those drawings/raffles and then literally call everyone who enters to tell them they won. They don’t feel bad about technically “cheating” people like this, it’s just another way to drum up clients. They get “winners” to book a session with them and invite other people, who they hope will also become one of their clients. We were taught to call it a “party”, a “pampering session”, whatever sounds best. They say the more people you invite and the more they buy at the party, the more discounts/freebies you (as the party host) will get. Yesterday I had all my bridesmaids over (except one) and Amber had her bridesmaids over as well. The MK rep was scheduled to come over at 4pm. When I talked to her two days prior to confirm our appointment (she called me at 8:30pm in the evening ???? ) she said she’d come over at 3:30pm to set-up. I figured no problem since I told all the girls to come over around 3pm; the MK lady mentioned free goodies for people who showed up early. Everyone arrived at my house by 3:30pm but no MK rep. I get a phone call telling me she was running late and would be at my place in 30 minutes (she also said we’d get some extra free goodies because of her tardiness). She didn’t show up until 4:30pm, an hour later! One of my bridesmaids had to leave at 4:30pm so she didn’t get to partake in anything. The MK lady shows up in a brand new Chevy Equinox, which I found out upon research is awarded to sales reps that keep up X amount of dollars in sales. She comes in, apologizes for being late and immediately helps herself to the food I prepared for my guests. ???? A little unprofessional, but I brushed it off. After she sets up in the dining room we all sat down and went around the table introducing ourselves, what our skin-care concerns are and ‘how everyone knows Christine’; the MK lady kept calling me Christine to which my sis and friend kept saying “nuh” afterward, haha. Finally, the MK lady introduces herself and went from talking about herself/the company to showing off her new car which she offered us the keys to go check out. ???? I thought this was a little unprofessional as it had nothing to do with why she was here. Also while we were sitting at the table I was drinking some Perrier and she says, “Christine could you get me some water? I’d love some Perrier.” ???? I was taken aback, but being the polite hostess I was, I poured her a glass. Once everyone came back inside from checking out the car, we began our session starting with skin care products, apparently MK’s version of a so-called facial. My definition of a facial apparently is very different than Mary Kay’s definition of a facial. The term “facial” refers to a skin care class, where you and/or other girls you invite all sit down and listen to the consultant explain and demonstrate how to USE their products. You give yourself a “facial”, pretty much. The products are nice, but you do all the work! You just learn about and sample their face wash, microdermabrasion, face lotion, lip mask and then their hand products during the class. Not much real pampering to it, unfortunately. Now, my flower girl was at this party (she’s 9) hoping to play with make-up, but for the most part, she was forced to sit and watch us put on beauty stuff. When it did come time for make-up all we got to try was some mineral foundation, eyeshadow, lip gloss, and mascara. We were limited to an extremely small representation of the Mary Kay line. Considering the suitcases she brought I thought we were going to have a LOT of product to play with. I got to play with more product at the Bare Minerals Master Event at the Sephora University than I did here. When we were done she took the girls one by one into the living room for a private consultation. In other words, trying to get them to buy something (apparently none of the girls bought anything). Amber and I were the last ones to have our consultation and we wanted to do it together, mainly because Amber wanted me there for moral support so she wouldn’t get sucked into buying a ton of products. As a hostess, I was entitled to $25 off a purchase so I got $29 worth of stuff. Amber got a $25 hostess discount too even though the MK lady made a snide comment to me on the phone about how she couldn’t get ahold of Amber so it’s really my party. Once we filled out the appropriate forms, the MK lady went out to her car to get our products. 15 minutes later she came back into the house informing us she didn’t have our stuff on hand and that she’d send it out to us the next day. She also had the nerve to ask if I was making alcoholic drinks due to the fact I was making Shirley Temples for a couple of the girls. ???? She then told us she’d like to spend 20 minutes talking to us some more about the company (aka trying to recruit us). All the girls except one followed my lead when I told her I wasn’t interested. In the middle of cleaning up the dining room, the MK lady suddenly decided she needed to leave and didn’t bother doing her 20-minute recruiting session. Although we weren’t interested, I thought it was kind of rude of her to suddenly be in a big hurry to leave when she showed up late. As a hostess, I was entitled to $25 of my product purchase. I decided to purchase eyeshadow and lipgloss, which were both demoed to me in the exact shades I ordered. 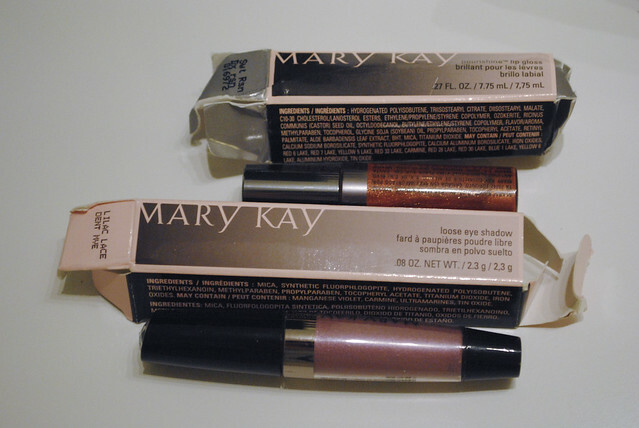 However, the MK lady did not have the shades of the product I ordered with her. Common sense would say, “Hey perhaps I should have the products in stock I plan to demo, especially since I’m expecting people to want to buy stuff. Plus it shouldn’t be too hard since there are only 3 different shades.” She didn’t have my shades of product so she told me she would send them out in the mail the following day. Amber had bought some product too that the lady did have on her, but for whatever reason, she decided she’d send Amber’s out the next day as well. The next day both Amber and I immediately had our cards charged, but our product didn’t show up until 8 days later. I had emailed our rep on Sunday to which she called me yesterday giving me a song and a dance about how she had to go through all these other reps to get my stuff (doesn’t explain the delay in Amber’s stuff); she also apologized for never touching bases with me on the status of my order. She said she’d put my stuff out in the mail that day, and we left it at that. Oh, and you know how I was told several times about receiving free goodies? I didn’t get a single thing unless you include the tiny fingernail sized sample of lip gloss that everyone got. What about my so-called bridal package? She didn’t say a word about it to me. Did my guests get any free goodies for showing up early and the MK lady being late? Nope. Nothing. To be honest, I was not impressed with how this pampering session turned out. It was a complete waste of time. The lady was a bit unprofessional with her tardiness and presumptuousness, and I felt mislead with what she kept offering (the supposed ‘free goodies’ and ‘bridal package’); she also seemed to care more about recruiting and talking about the business than getting us to try/buy stuff (after reading this it makes sense now). After this experience, I honestly wouldn’t recommend a pampering session with Mary Kay. I won’t be giving them my business in any shape or form ever again. 99% of Women Lose Money in MLM’s – So Why Are They Still Signing Up? OH my! I just came across your article and I’m mortified. I’m a Mary Kay Rep and I can say the way you and your friends were treated is not the Mary Kay way. Unfortunately, since we are independent business owners, some reps do things VERY differently than most. My Brides are my most spoiled customers and are always so happy after our appointment. I can’t apologize enough for her terrible behavior. I agree with you Rebecca this is not the way I do things either. If someone wins in my raffle then they receive. I hosted a party for my consultant and she gave me $200 worth of stuff. I love Mary Kay and what it stands for and hate some consultants make people feel this way. In my opinion she needs a better consultant. I do know one thing I LOVE MK and did before my was a consultant. I have to agree with Rebecca, I am mortified. Every consultant is different and I can promise you that the behavior you witnessed is not at all the Mary Kay way. I’m truly at a loss for words! This completely breaks my heart! I am also a MK consultant and would never say that I was trained or taught to mislead in any way! The idea behind sharing the products in the form of a DIY facial is because we want to educate women about their skins needs and what our products do for them when used properly. Nothing worse than spending 100+ at a cosmetic counter after someone else applied your beauty products and then ending up at home without a clue of how of what order to use them in! Mary Kay business culture is about supporting, encouraging, enriching, and pouring into women. This lady clearly was not taught or trained this way, but as someone said each woman is an independent business owner. Just by some of the personal traits you described, she doesn’t seem like anyone I would want to be around or purchase from!! It only takes one bad apple to ruin the batch. Most women who swear off MK had a experience similar to yours and it makes me so mad at those “bad apple” reps!! So sorry you didn’t get to really experience the true heart of Mary Kay. I hope you will give it another try sometime in the future without another rep even if just a one-on-one facial! The products and company are really amazing!! I just came across this article 8-9 years late apparently. But gee! That’s awful! I have never and would never do anything like that. That’s absolutely awful. I am truly sorry you had such a poor experience. That is not how our company is normally represented. I’m so sorry you received asuch a bad experience. I’ve been an Independent Mary Kay Beauty Consultant for 10 years now and can honestly say that that is not the Mary Kay way. I see why we get a bad rap, but honestly it isn’t the way that most of us that are Mary Kay reps behave. Blessed be. She didnt know what she was doing! You need a better consultant to have a great MK experience. You have to remember all us consultants went through the experience before we were consultants. If it was that bad I wouldnt be one now and I have been for four years! Not everyone consultant is the same remember that!